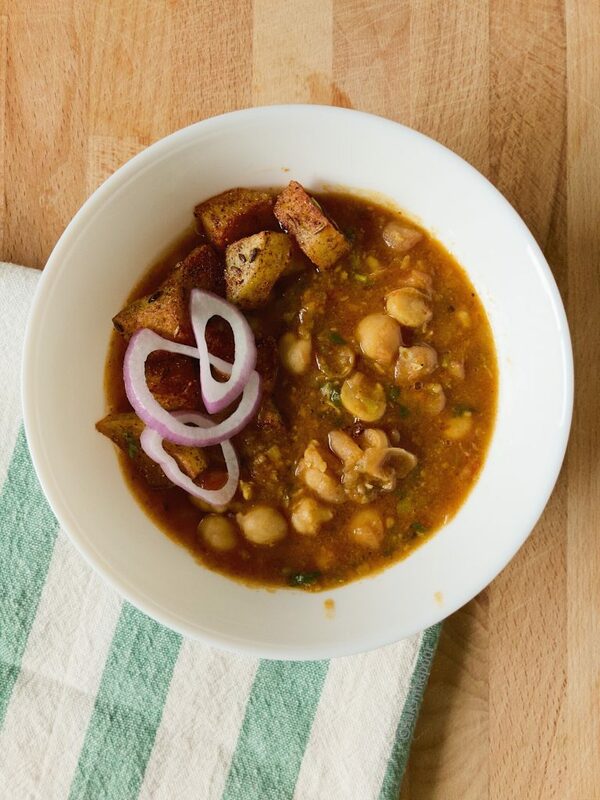 Chhole or Channe or Safed Channe or Garbanzo Beans or Chickpeas! Whatever you call them, they are ubiquitous across cuisines and thanks to the melting of food cultures on social media platforms, everyone’s trying recipes from different regions. But when someone mentions Channe, the first first dish that comes to my mind is Punjabi Chhole. If there’s any consolation then Hummus comes a close second. But whether it’s on the side of bhature, puri (leavened and unleavened deep fried Indian breads, respectively) or steamed rice, the Punjabi Chhole dish is somewhat of a rockstar! Great for dinner menus for gatherings or on it’s own with a simple side of roti or rice, it is something that will always dazzle! Kanika and I (both Punjabis!) recently discussed how we made Chhole and with the exception of two small details, our recipes were pretty similar. I use tamarind as the souring agent while she skips that entirely sometimes. Another difference was how we used the whole spices. She usually adds the whole spices as they are in the tadka while I roughly pound them because my (oh so fussy!) Spouse doesn’t enjoy munching on whole spices. She also sprinkles the garam masala at the end which is something I overtime forgot frankly. I tend to put the garam masala much earlier with the other spices out of habit now. This chat with Kanika actually reminded me how lovely that aroma of garam masala is, over a hot steaming curry! Exchanging notes on Chhole with Kanika made me realise that apart from the addition of the tamarind, her recipe is exactly like my mother’s! But it’s not just the sourness and spiciness that sets Punjabi style chhole apart. They also look far richer in colour than humble yellow coloured chhole curry that you would have seen in the rest of North India. To get an appetising darker colour in the chhole, some people throw in a tea bag or even a spoonful of Amla (Indian gooseberry) powder that turns the dish a bit darker. My mom often makes Chhole without any onions and adds extra roasted cumin powder along with some amla powder to make a darker tangy Punjabi Chhole. I however do not rely on these hacks but instead focus on the one step that determines the taste and even look of all curries Punjabi! What is that one step that Punjabi dishes like Chhole have that sets them apart? The secret to a good Chhole or even Rajma curry lies in how well you cook the onion tomato tadka. It is the the dark brown (almost but not quite burnt) state that you have to cook the onions to that determines the colour and taste of the dish! And yes, always, always cook the tomatoes till you see the oil separate on the sides. A common mistake when cooking these punjabi dishes is not making the Tadka properly. Read more about what a Tadka is here on the blog. Now you know the secret, let’s go ahead with the recipe. Wash and soak the chickpeas in cold water overnight or for 5-6 hours. Adjust the water in the soaked chickpeas to about approximately 3 cms and cook for 3 whistles in a pressure cooker followed by 5 minutes on low heat. To prepare the tadka, start by soaking the tamarind in half a cup of hot water. Leave this while you gather and prepare other ingredients for the recipe. In a food processor, process the onions and garlic to a fine chop. Keep aside. Purée the tomatoes, ginger and green chilli together. You can prepare roasted cumin powder till then. In a small pan or tawa, dry roast cumin seeds till you can see the the colour change to a darker brown and can smell the aroma. In a mortar and pestle, grind the cumin and keep aside. You can roast and grind a bigger batch of roasted cumin powder and grind it in a dry grinder. This roasted cumin powder is great for salads, chaats and raitas (spiced yogurt)! Put all the whole spices in a mortar and pestle and grind to a coarse spice mix. For the tadka, heat oil in a small kadhai. Once the oil heats up, add the coarse spice mix and let the spices bloom for 30 seconds. You will be able to smell the aroma. Next add the chopped onions and garlic and mix it in. Cook the onions till they become a dark golden brown but careful not to burn them. When the onions are light golden, you should be ready with the tomatoes as the onions will only take a couple of minutes to be done. Add the tomato-chilli-ginger purée and mix it in the onions. 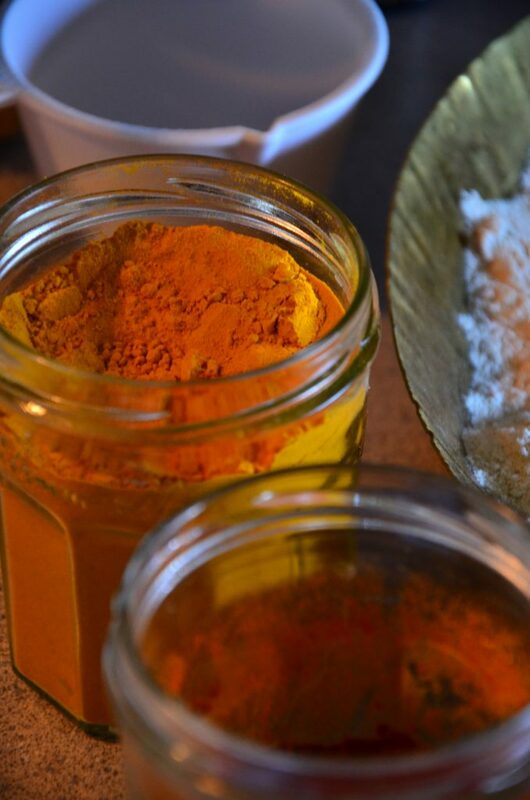 Throw in the salt, turmeric powder, red chilli powder, coriander powder and garam masala and stir. Let the tomatoes cook on low heat and stir occasionally. Once you see the oil separate, the tomatoes are cooked. Add 2-3 ladles of boiled chickpeas in the tadka and press them to mash them with the back of the ladle/spoon. We do this to thicken the curry. Cook for another 5 minutes on low heat and then transfer the tadka in the pressure cooker with the rest of the chickpeas. Add tamarind pulp and 1/2 cup of water if needed. If you prefer the chhole to be thicker, you can skip adding the water. At this point, add the roasted cumin powder and mix it in. Pressure cook the chickpeas for one whistle. Remove from heat and let the pressure release on it’s own from the cooker. 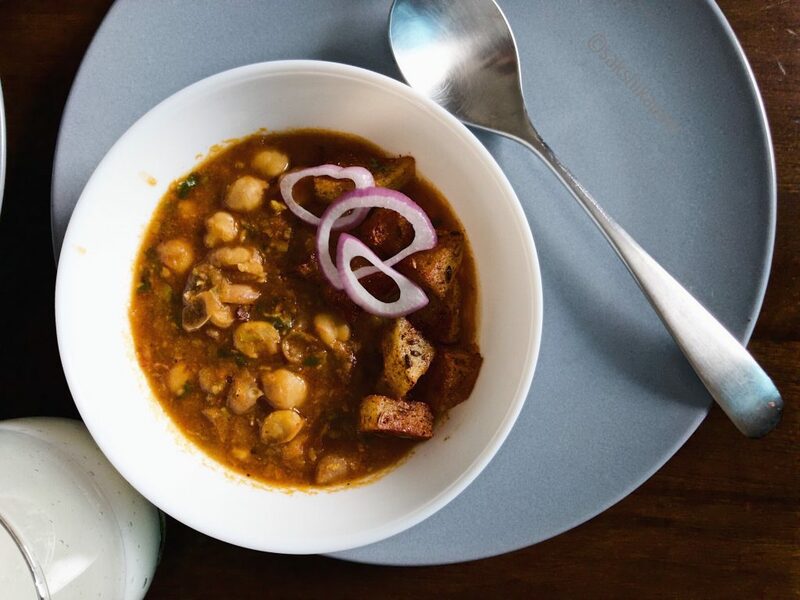 Take out the chickpeas in a serving bowl and top them with chopped fresh coriander leaves. As a serving suggestion, I recommend that you fry some potatoes and slice some raw onion and add on top of the Chhole bowl. 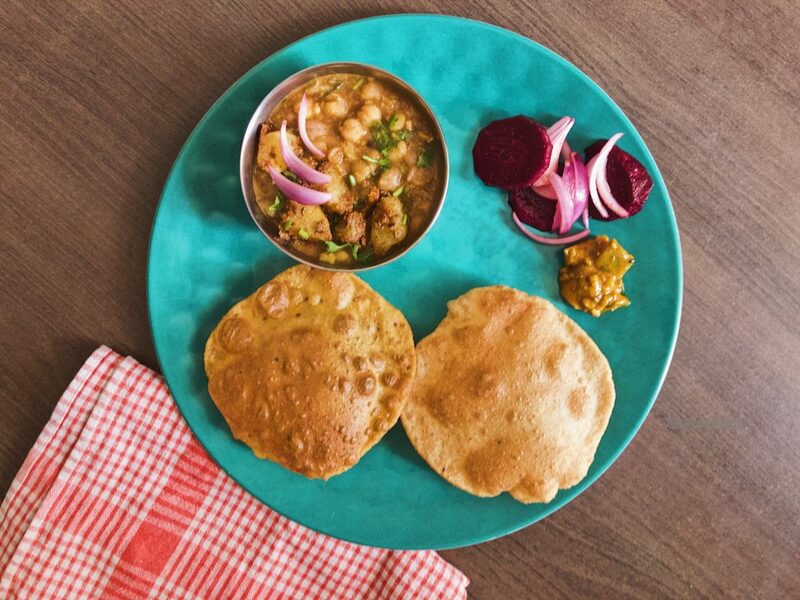 Serve these delicious spicy Punjabi Chhole with bhaturas, puris, chapati or rice! Would be great with some quinoa too! To prepare the tadka for the Chhole, start by soaking the tamarind in half a cup of hot water. Leave this aside while you gather and prepare other ingredients for the recipe. Now for the tadka, heat oil in a small kadhai. Once the oil heats up, add the coarse spice mix and let the spices bloom in the hot oil for 30 seconds. You will be able to smell the aroma. When the onions are brown, add the tomato-chilli-ginger purée and mix it in the onions. Throw in the salt, turmeric powder, red chilli powder, coriander powder and garam masala and stir. Pressure cook the chickpeas for one whistle. Remove from heat and let the pressure release on it's own from the cooker. In a small pan or tawa, dry roast cumin seeds till you can see the the colour change to a darker brown and can smell the aroma. In a mortar and pestle, grind the cumin and keep aside.You can roast and grind a bigger batch of roasted cumin powder and grind it in a dry grinder. This roasted cumin powder is great for salads, chaats and raitas (spiced yogurt)!